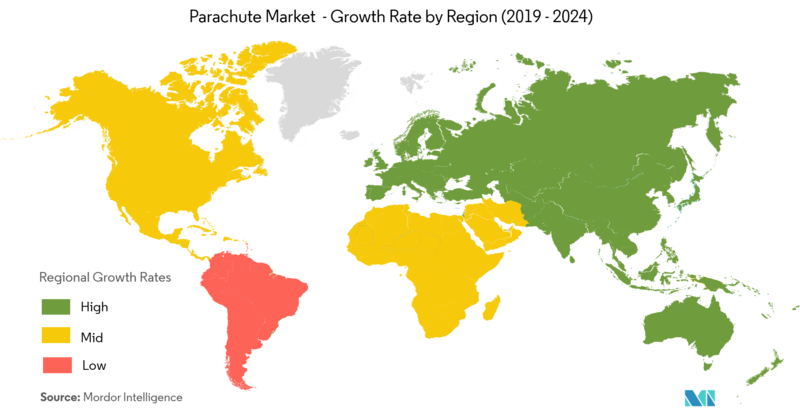 The Parachute Market is segmented by Type (Round Parachute, Cruciform Parachute, Ram Air Parachute, and Other Types), Application (Military, Cargo, Sports, and Other Applications), and Geography. 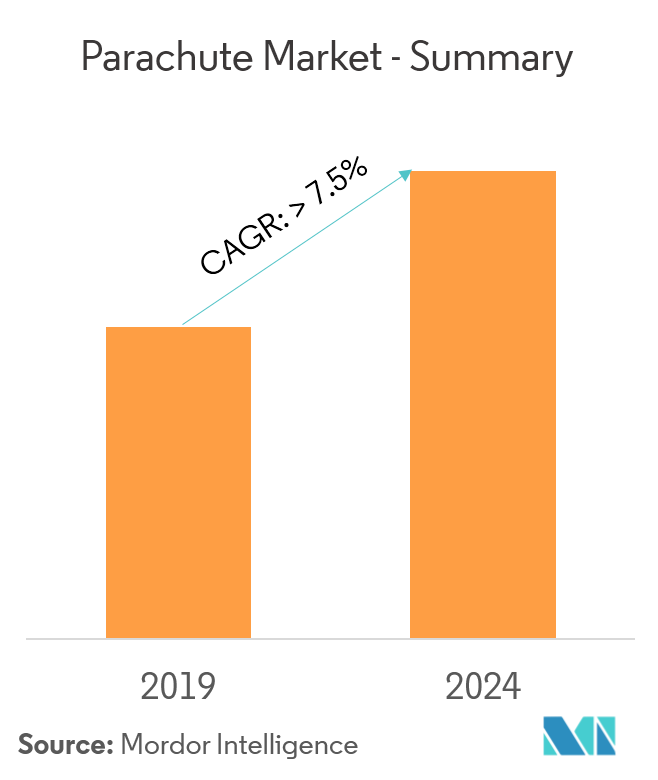 The parachute market is anticipated to register a CAGR of over 7.5% during the forecast period (2019 - 2024). New and advanced lightweight parachutes are gaining popularity in the market. Moreover, with the growth of smart textiles, several researchers are working toward the use of such technology for parachutes. Increase in the use of parachutes by military paratroopers and fighter pilots, and for sports activities are expected to drive the market growth. Several accidents, due to parachute failure have raised concerns over the existing parachutes. Nevertheless, R&D and product innovations are expected to enhance the safety of parachutes, which can propel the market growth. Additionally, the use of parachutes in UAVs is also expected to support the market growth during the forecast period. In 2018, round parachutes held a major share, followed by ram air parachute. Round parachutes are generally used in military, emergency, and cargo applications. Most military round parachutes are conical or parabolic in nature and are designed to be either steerable or non-steerable. However, steerable versions are not as maneuverable as other types, such as ram-air parachutes. The steerable type round parachute has cuts, which allow air to escape from the back of the canopy, providing the parachute with limited forward speed. This gives the parachutist the ability to steer the parachute and to face the wind, to slow down the horizontal velocity for the landing. Variables are likely to impact the manner and speed of the parachute’s descent, as it depends on the force of the wind. However, it is anticipated that cruciform parachutes may register the highest growth in the coming years. The cruciform parachute is designed to decrease the oscillation and violent turns during the descent. The cruciform design is relatively new and is set to be used by the US Army, as it replaces its older T-10 parachutes with T-11 parachutes, under a program called Advanced Tactical Parachute System (ATPS). The United Kingdom witnessed an increase in the usage of parachutes in the commercial sectors. In the United Kingdom, various companies, such as the UK parachuting, are offering various experiences to the consumers, in terms of parasailing and paragliding activities. In addition, the British Parachute Association is engaged in organizing, governing, and offering sports-related recreational activities in the country. Moreover, the company is also engaged in maintaining, as well as promoting the highest standards of safety, in addition to offering training for recreational skydiving in the United Kingdom. The Federation Francaise de Parachutisme is engaged in organizing, governing, and offering sports-related recreational activities in France. Moreover, the federation is also engaged in maintaining, as well as promoting the highest standards of safety and training for skydiving in France. Likewise, the growing tourism in Germany, France, Russia, and Norway, may also contribute to the growing use of parachutes for recreational activities in the future. 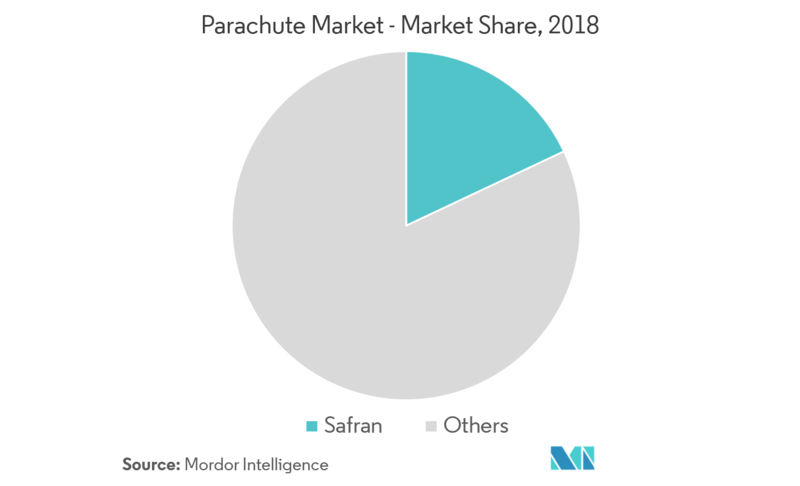 Aerodyne Research LLC, Safran, FXC Corporation, and Mills Manufacturing are some of the prominent players in the parachute market. The intensity of rivalry among the competitors is high, mostly for obtaining long-term military contracts. Majority of the military contracts are catered to the government’s specific manufacturers and R&D units that have been developing technologies and military equipment for their respective governments. With the development of smart textiles, several parachute manufacturers are now offering lightweight parachutes for military and sports applications.